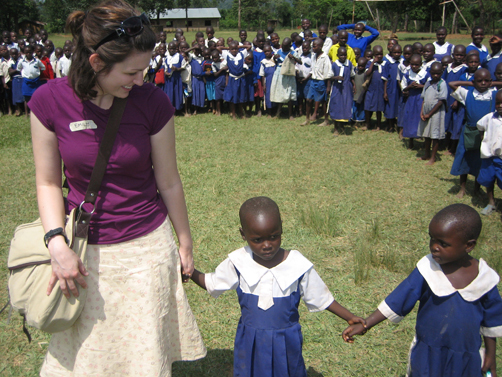 I traveled to Kenya with the humanitarian group Reach the Children in 2009. We taught hygiene in primary schools, experienced the culture, and went on a safari! It was an awesome experience. Here are some things I learned while I was there. 3. Never take a warm shower for granted. 4. The best music for getting ready for bed is an African men’s choir that is practicing nearby. 5. Monkeys will steal your food if given the chance. 7. A malaria mosquito bite is painless. 9. Sleeping on planes is hard. 10. Sleeping on planes is easier if you have ear plugs, an eye mask, and Tylenol’s Simply Sleep. 11. I’m a terrible barterer. 12. There’s no hurry in Africa (bumper sticker). 13. Most Kenyan children don’t have shoes. 14. I should have packed more Febreeze. 15. Kenya is green in July! 17. Nothing feels better than rain after a hot, long day. 19. A hot water bottle is a good bedmate. 20. Baby powder can get the grease out of your hair. 21. Kenyan kids, especially those 3-5 years old, are adorable. 22. Jambo means hello in Swahili. 23. Always travel with Dramamine. 24. AIDS clinics and awareness programs are doing great things. 25. Malaria pills give you weird dreams. 26. Peeing in a hole isn’t as hard as I thought it would be-just squat low. 27. I want a baby elephant. 28. Smiles and waves are universal. 29. Process foods sit better than whole foods. 30. Never travel without ear plugs. 31. It would cost about ten U.S. dollars to have a baby at a hospital in Kenya. 32. Friends hold hands, even if it’s two older guys. 33. There are some weird-lookin’ bugs out there. 34. Obama has a lot of cousins and nieces and nephews in Kenya … or so they claimed. 35. The heads, shoulders, knees, and toes song is (somewhat) universal. 36. Potato chips taste even better in Kenya. 37. I want to adopt a few hundred orphans. 38. I can successfully hand wash my underwear and one of my skirts. 39. You can feel at home in a foreign place. 40. Most girls in Africa shave their heads. 41. I miss cheese terribly when I don’t have it. 42. My nails become extra shiny in Kenya. 43. There are albino Africans. 44. I can’t get enough of seeing women carrying large bags and baskets on top of their heads. 45. Even if I go to bed early, I still have a hard time getting up early. 46. Watching lions (that are just 15 feet away) mate is pretty cool. 47. I should have packed some Pringles. 48. If you’re getting up to go to the bathroom in the middle of the night, don’t forget you’re sleeping in a mosquito net. 49. Little bananas taste better than big ones. 50. I love to see the world. 51. Kenyans are the sweetest, kindest, nicest people ever. 52. I will never stop caring about or helping them.